Michelle Obama at Newark school. A group of New Jersey school children has received a pep talk on healthy eating from first lady Michelle Obama. Mrs. Obama visited Newark Thursday afternoon to talk with students about how eating better and exercising more can improve their lives. She met with some students individually and then addressed an assembly at the Maple Avenue School. "In order for you to do the things we need you to do in the future, you need lots of energey," she told the children. "You gotta be healthy to change the world., You gotta eat right, you gotta exercise, right? So you grow up to be healthy and strong." Students there have started several programs to promote healthier eating, including partnering with local farmers markets. Mrs. Obama entered to a chorus of screams from the third- through eighth-graders. After her speech, she exchanged hugs and handshakes with many of them. 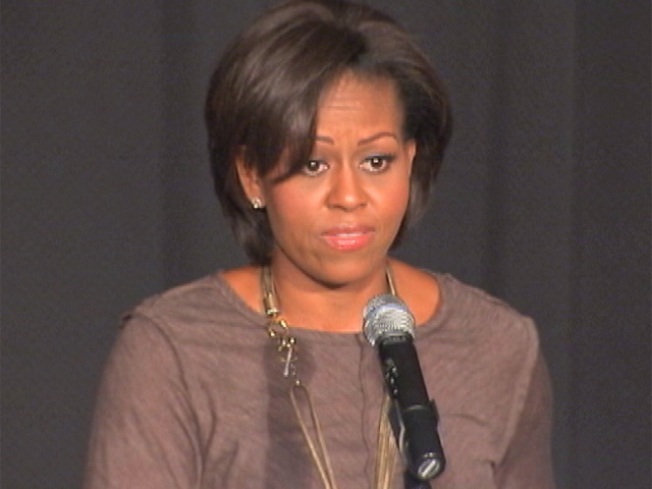 The event was part of Mrs. Obama's "Let's Move" initiative against childhood obesity. "You play too many video games," she chided as a loud groan filled the auditorium at Maple Avenue School. "I know, I know," she laughed. "You're just like my kids!! You gotta move around, you should be running and sweating and dancing!"